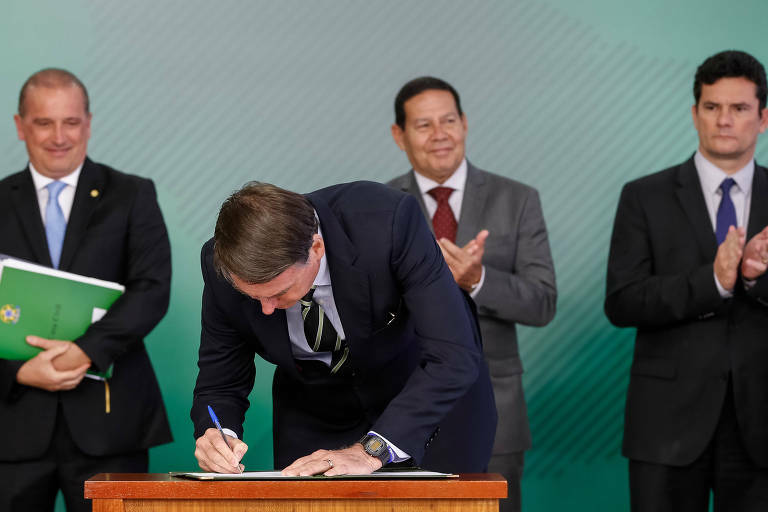 President Jair Bolsonaro fulfilled one of his main campaign promises on Tuesday (15th) when he signed a decree changing Brazil's gun ownership regulations. The order takes immediate effect and allows private citizens to own guns without having to prove a real need, as the previous law mandated. Without mentioning former president Lula da Silva by name, Bolsonaro said that previous administrations denied people their right to own guns. "The government at the time denied this right. But the population decided for owning guns and ammunition, and we can't deny them that," he said, mentioning the gun ban referendum of 2005, during Lula's term. At the time, 64% of the population voted in favor of not banning guns and ammunition from Brazil. He also said that the decree only regulates gun ownership (that is, to keep a gun at one's residence) and other measures regarding carrying weapons fall under the Legislative. The decree establishes that gun owners need to renew their registration every ten years instead of the current five-year period and create requirements that need to be evaluated by a Brazilian Federal Police officer before the prospective gun owner is allowed to buy his weapon. There is also a limit of four weapons per person, unless the applicant proves a need to have more guns -- in case of multiple properties, per instance. Parents of children and teenagers and guardians of people with special needs will be required to keep a safe or a locked cabinet to keep their weapons. "Sometimes we see small children that put their hands inside a blender, they turn it on, and they lose a finger. So what are we going to do, outlaw blenders? It's a matter of education and guidance," said Chief of Staff Onyx Lorenzoni. Gun ownership is regulated in Brazil by federal law. There are several requirements for a person to own a gun: be over 25 years old; have a lawful occupation; a fixed residence; never have been convicted of a crime nor be in a trial; prove to be psychologically and technically able to use a gun and declare an actual need for a weapon. But the decree provoked divergence among the president's allies. Some thought it would have been a better move to issue an executive order instead of a decree. Opposition leader Paulo Pimenta said that his party, PT, will file an injunction at the Brazilian Supreme Court to review the new law's constitutionality and suspend the decree. One company, Taurus Armas, basically detains the monopoly on producing and selling firearms in Brazil. But Taurus stock plummeted on Tuesday after the decree's announcement. Analysts say the price fall happened because of a tactic called "buy the rumor, sell the news." Foreign markets considered the decree ineffective for business because it doesn't change Taurus' privileged position in the Brazilian firearms market. The decree doesn't revert the rule that blocks importing of personal defense weapons to Brazil, a regulation that favors Taurus.